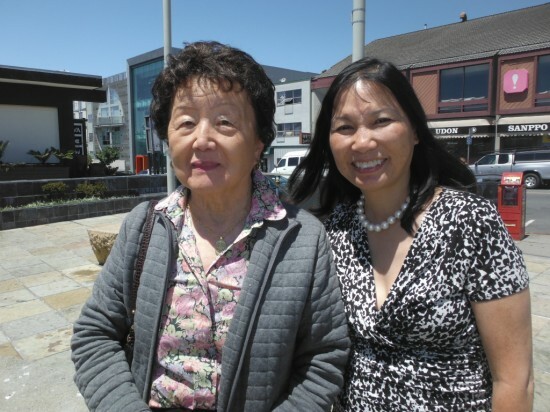 Priscilla Ishizaki (left), sister-in-law of donor Sadako Ishizaki, with JACL Executive Director Priscilla Ouchida in Japantown’s Peace Plaza. SAN FRANCISCO — Before her death in June 2011 at the age of 90, Sadako Ishizaki lived quietly in San Francisco’s Japantown at the Hotel Tomo. Although her late husband, Kenji Ishizaki, was a Thousand Club member of JACL, the $1.3 million she bequeathed to JACL was a surprise. JACL Executive Director Priscilla Ouchida recently met with Priscilla Ishizaki, Sadako’s surviving sister-in-law, to discuss the gift. According to Ishizaki, Sadako was a native San Franciscan who often performed in oshibai (Japanese plays) and played the koto. The Ishizaki family established the famous Yamato’s restaurant chain in 1947. Sadako was a waitress at the original Yamato’s on Pacific and Powell in San Francisco when she met and married her husband. She helped her husband establish the Yamato’s in the Century Plaza Hotel in Los Angeles in 1966, and was a fixture at the famous dining spot until it closed in 1992. The restaurant was frequented by movie stars and other celebrities. Priscilla Ishizaki will continue to work with Ouchida on plans to name a youth program after Sadako.